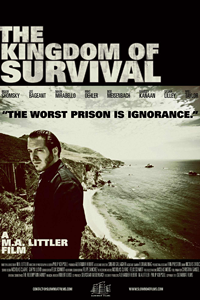 The Kingdom of Survival explores modern skepticism in America, challenges the status quo and uncovers provocative links between survivalist philosophy, ecumenical spirituality, radical political theory, and outlaw culture. The audience is invited into a thoughtful conversation with the likes of Prof. Noam Chomsky, Dr. Mark Mirabello, Ramsey Kanaan, and the riveting final interview with beloved author, Joe Bageant. These unique thought leaders cast a rare shadow of doubt over our most blindly accepted American traditions. By framing this journey in a cross-country travelogue, maverick writer and director M.A. Littler connects art, religion, academia, alternative media, utopianism, anarchism, globalized capitalism and radical fringe philosophy in an elegant American tapestry. The transformative visual execution of the cinematography acts as a lingering contextual reminder of the events that shaped the featured philosophies. By remaining observantly agnostic to the subjects, the film is able to honestly investigate the physical and psychological practices of diverse individuals in a conflict-ridden and confused post-modern world. In a time of brainwashing corporate and political propaganda, The Kingdom of Survival reunites us with the life-changing spirit of the outlaw highway. "We have to go within, man. We have to go within and find something that brings joy to our souls."